In Southern Nevada, luxury mountainside home locations with gorgeous views are the pinnacle of country club lifestyle. Nestled in the foothills of McCullough Mountains lies MacDonald Highlands, the upscale country club community in Henderson, NV. MacDonald Highlands is the preferred locations for those who seek to elevate their lifestyle and live at the top. There are many appeals within this community that include a world-renowned 18-hole championship golf course, a state-of-the-art fitness and athletic center and a uniquetopography that offers unprecedented views. In Southern Nevada, luxury mountainside home locations with gorgeous views are the pinnacle of country club lifestyle. Nestled in the foothills of McCullough Mountains lies MacDonald Highlands, the upscale country club community in Henderson, NV. MacDonald Highlands is the preferred locations for those who seek to elevate their lifestyle and live at the top. There are many appeals within this community that include a world-renowned 18-hole championship golf course, a state-of-the-art fitness and athletic center and a unique topography that offers unprecedented views. MacDonald Highlands’ pride and joy is DragonRidge Country Club. Named after a rocky ridge, known to residents as the ‘Sleeping Dragon’, this exclusive and private golf course is catching the attention of locals as well as the world’s best players. 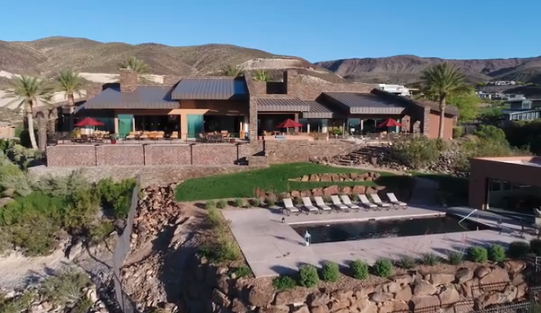 A beautiful brand new clubhouse, which features formal dining, two separate mixed grills and lounges, a fitness center, a swimming pool and golf pro shop complementing the beautiful landscape of the DragonRidge golf course. MacDonald Highlands guard-gated development includes three neighborhood parks that will encompass approximately 10 acres and feature tennis, basketball and volleyball courts, play areas and picnic facilities. Also featured is five miles of fitness trails that will meander throughout the 2 square mile community and provide access to nature trails that lead deep into the surrounding McCullough Mountains. For those who are looking to elevate their lifestyle and live at the top, MacDonald Highlands’ custom homesites are the preferred choices. Each subdivision within this premier community is strategically planned to offer the most to each homeowner. If you wish to learn more about MacDonald Highlands, contact us at 702-614-9100.